With recent reports of teens trashing the 9/11 Memorial and reducing a bus monitor to tears, it’s refreshing to hear about about a youngster going out of his way to help others. 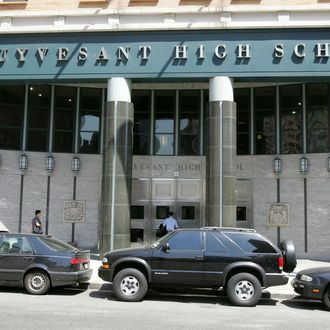 However, officials at Stuyvesant High School, the city’s most elite public high school, aren’t praising the student for his generosity since his random act of kindness involved photographing various Regents exams and distributing answers to more than 50 other students. In a case that will surely be used to justify the continued existence of cell phone storage trucks outside of New York public schools, last week a Stuyvesant junior was caught snapping photos of a citywide Spanish exam. A little digging revealed that he’d also distributed shots of the physics and English Regents exams, along with his answers, to dozens of classmates. The Department of Education is investigating the allegations and so far the students who received answers have yet to be formally disciplined — though their parents have been notified, so this is going to be one hellish summer vacation. Officials are still trying to determine if the students asked for answers, paid the junior, or if he just risked his shot at a spot in the Ivy League out of the goodness of his heart. His motive will determine whether or not he goes down in school history as a modern-day Robin Hood, but either way, he won’t be returning to Stuyvesant in the fall.